Digital Advertising Media (DAM) is the only Digital Signage company in the WORLD that connects our communities together, across the nation on a grass roots level. We also create jobs in advertising for those local communities in the process. The organizations involved in sponsoring our Electronic Billboard systems include various clubs, local governing bodies, disability groups, police, health and local authorities, universities and colleges. They’re connecting networks across the US and now moving abroad to other countries. By sponsoring a Digital Billboard System at the low annual cost of $200.00 per location, your company will secure ongoing exposure worth in excess of $5000 throughout the network of Digital Billboards. Your company will get 3 FREE billboard advertisements on each system you sponsor for six months to a year*. Each System will have your Company Name displayed at all times as a full sponsor. 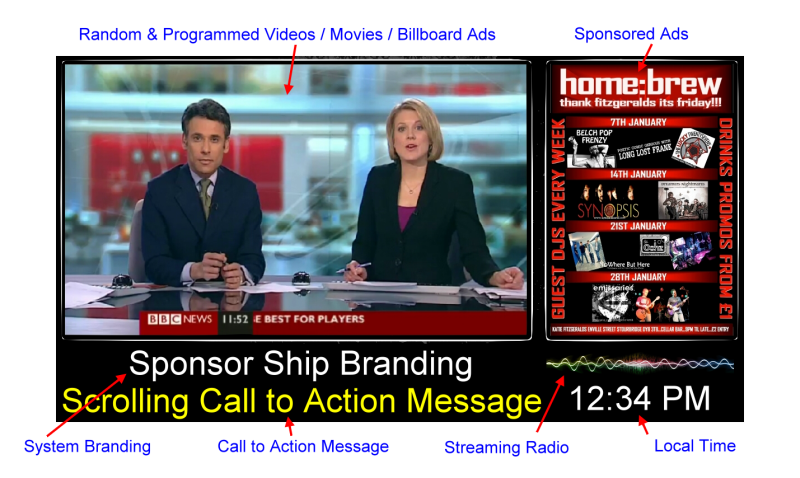 Your ad will be shown across the network of digital billboards that don’t conflict with you message. Your business will be listed on the Main website in the Community Partner/Sponsor area with contact information and links to your own website. You will assist in providing an advertising job for one new salesperson for each system you sponsor. You will be providing an ongoing income source for the the sales person assigned to manage it. Your funding will assist in extending a network of electronic billboards designed to provide unreachable-demographic communities, information that is not controlled by corporate America or large media organizations. Sponsoring digital signage will enhance your company’s reputation throughout the local communities and across the nation.